Power Metal can be direct in several ways, either it smacks you right in the face with blunt force or it annoys the hell out of you. Or it’s right in the middle, not cheesy enough to be annoying and way too weak to be called Power Metal. 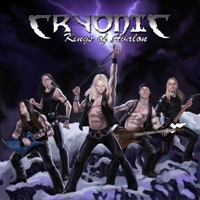 CRYONIC’s new release “Kings Of Avalon” qualifies for the latter, when they do those classic gallop guitars and double bass drums I just want to puke. Power Metal must have POWER. It cannot be laid back and lazy and when it turns over and becomes happy and lightweight it’s just bad. But when they turn down the speed a little and twists more to Heavy Metal CRYONIC are not bad at all. Bigswede has a really good voice, maybe not as strong and varied as Johnny Lindqvist or Daniel Heiman but he’s absolutely close to their range. But with some more training, a little higher recording budget and a crash course in how to pronounce words in the English tongue he could absolutely be a reference point in Swedish Metal history. The thing I like about the production is that it feels real and honest. It is not as compressed and adjusted as a lot of new bands tend to chose nowadays. The peeled off production makes it sound a lot like a demo though and the quality of the performance from the rest of the musicians strengthen the feeling of do it yourself. That isn’t necessarily all bad, in a way I prefer a production with a live feeling rather than something computerized. The thing though, everything feels so familiar with CRYONIC, everything has been heard before and I’m sure there are millions of songs out there with the same titles. “Tear Down The Walls”, “No more”, “Demon”… But on the other had that doesn’t matter really because the songs are catchy and compared to other bands in the genre CRYONIC has a lot of variation in the melodies and the record is nicely balanced between fast and slow songs, of course there’s real power ballad too, “Seven Doors”. “Kings Of Avalon” will not end at the top of my year-list but it is a good party album. I doubt it holds for more than a few spins though.